As an area of high topical interest , Biopolymers New materials for Sustainable Films and Coatings covers the development and utilization of polymers derived from bioresources, with a particular focus on film and coating applications. With growing concern for the environment and the rising price of crude oil, there is increasing demand for non-petroleum-based polymers from renewable resources. Leading research groups worldwide in industry and academe are working on such technology with the objective of applying the latest advances in the field. 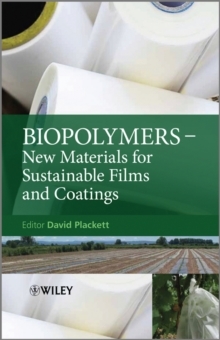 Written by well-respected experts, this text systematically covers the extraction and production of selected biopolymers as well as their properties and application as films or coatings in a variety of uses. The areas addressed include food packaging, edible coatings, paper coatings and agricultural films. Intended for researchers and students, this book will also be of interest to industry, especially in terms of the practical applications.